Conservation group Western Values Project Action announced today a six-figure advertising campaign in New Mexico targeting Senator Martin Heinrich, urging him to reject President Trump’s Interior Secretary nominee David Bernhardt’s nomination on the Senate floor after he voted to support the ex-lobbyist in committee. 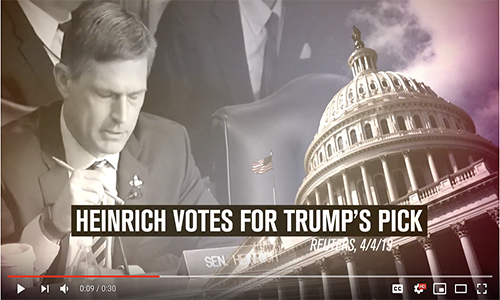 Last week, Senator Heinrich voted to move the conflict-ridden Interior Secretary nominee out of committee and to a full Senate vote, a reversal of his previous opposition to Bernhardt during his controversial deputy secretary nomination. The ex-lobbyist has some 26 known conflicts of interests before the department he may soon manage. Bernhardt’s Senate confirmation floor vote may come as early as tomorrow. The advertisements will begin airing across the state on Wednesday and can be viewed here. This week, Oregon Senator Ron Wyden called for a Department of Justice investigation into Bernhardt and his former firm, Brownstein Hyatt Farber Schreck, after a New York Times story published information that showed he may have conducted unreported lobbying activity for a former client, a potential violation of the Lobbying Disclosure Act of 1995. Analysis by the Washington Post found that Bernhardt’s former lobbying firm has nearly quadrupled its lobbying income since his confirmation as deputy secretary. In a press release, Senator Wyden called for Bernhardt’s nomination to be ‘stopped, or at minimum delayed, until the Senate and the American people get all of the facts.’ An earlier investigative report found that within four months of his deputy secretary confirmation, Bernhardt pushed for a decision that would be beneficial for the same former client, Westlands Water District. During Bernhardt’s committee hearing, Senators were unable to get clarification on several key conflicts of interest questions. Senator Heinrich along with one other Democrat and an Independent voted with every Republican committee member to confirm Bernhardt, Trump’s most conflicted cabinet nominee to date. In addition to his laundry list of conflicts of interest, Bernhardt has overseen some of the department’s most controversial public land decisions, including opening millions of acres of public lands to industrial oil and gas development and mismanaging America’s national parks during the historic government shutdown. He’s been involved in at least 17 scandals prior to Heinrich’s supportive committee vote.